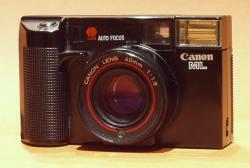 The Canon AF 35 ML is a luxury compact of the early 80's. Introduced in 1981, the Canon AF 35 ML is still up to date. The light meter is an accurate silicium cell. The autofocus is made by CCD, a rare feature at that time. It has a built-in GN 11 flash. The lens, a 40 mm f/1.9 in 5 elements, can take standard 48 mm filters. Focusing and auto-exposure lock, DX code, automatic film advance, very fast lens, compact body, this camera still meets modern standards. The sound goes clac-zzz clac clac-zzz clac clac-zzz clac, that is three shots in a row. The filst clac is the shutter, the zzz is the film advance and the second clac is a mystery.